Chinese new year is here again. I would like to wish everybody a prosperous and successful new year. 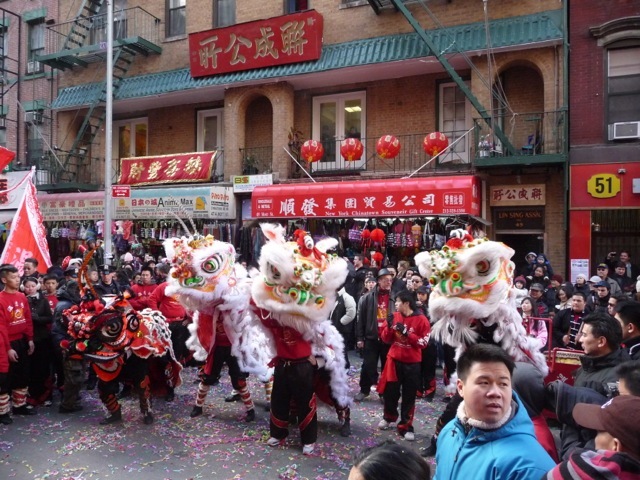 50 years ago in the early 60s, Chinese new year in New York’s Chinatown was a noisy and smoky affair. Even though firecrackers were officially banned, the police tolerated it as a cultural tradition. Policemen wearing motorcycle helmets patrolled the streets dodging firecrackers and shooting rockets, but would intervene if fireworks were dangerously played. Various kung fu schools would parade their lion dance troupes, greeting stores and being rewarded with red envelops of money. The big drums, gongs and cymbals produced stirring martial cadence to accompany spirited lion dances. 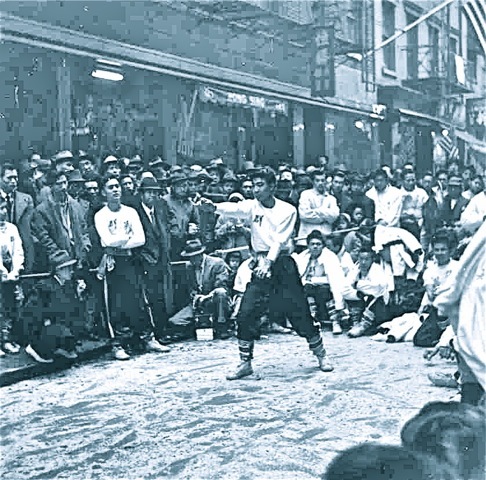 Every so often, the troupes would stop, round off a circle, and members would demonstrate their kung fu and traditional weapon katas. These were intently watched by appreciative crowds. When my kung fu school paraded, my kata demonstration was my five minutes of fame. 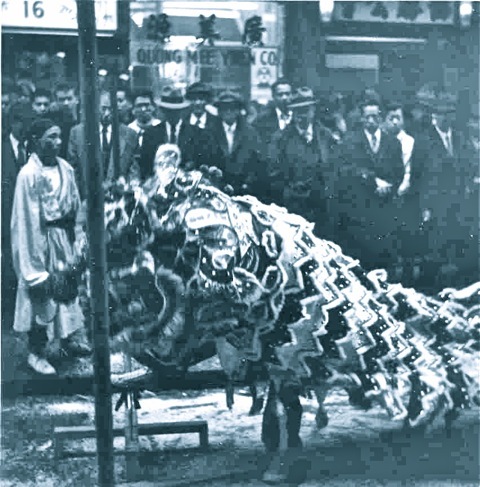 The lion dance was an exciting undertaking as people threw packets of lit firecrackers at the lions. The lion dancers would be oblivious to the exploding firecrackers, demonstrating stoic courage under fire. Nowadays, fireworks are vigorously banned in New York’s Chinatown. In place of loud exploding firecrackers covering streets with red paper fragments and the pungent smell of gunpowder, silent shooting confetti carpet the streets with odorless colorful paper bits. It is less exciting but nobody is hurts like my friend was when his right eye was blinded by a firecracker. Lion dancing skills have been improving. 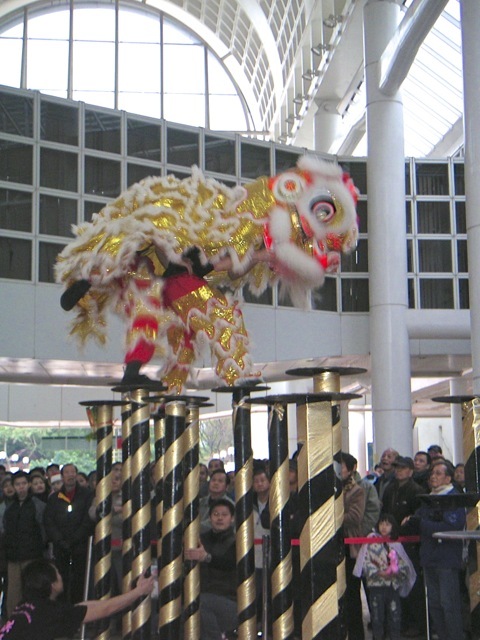 This lion in Hong Kong was dancing on high pedestaled disks. The two dancers coordinated their movements and pranced from disk to disk, keeping the spectators breathless. 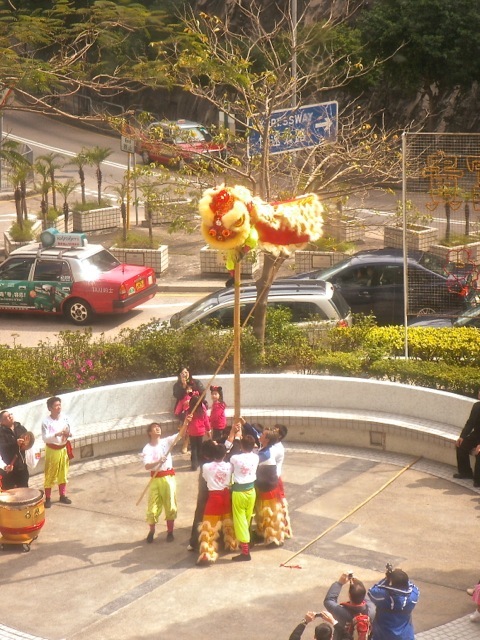 This lion bringing good luck to my residence building in Hong Kong climbed up a bamboo pole with the lion head. His fellow trouper on the ground held up the lion’s tail with another bamboo pole. 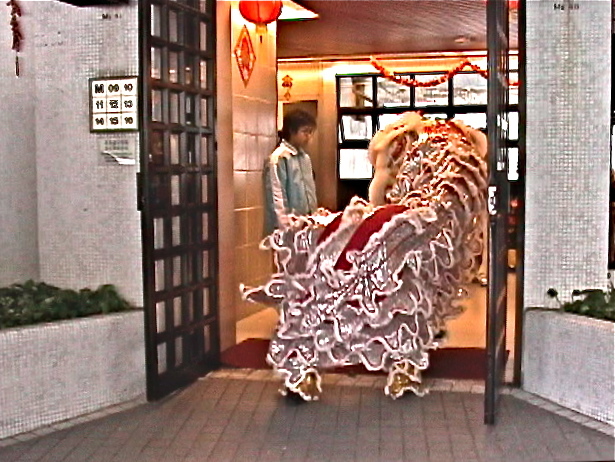 This lion danced at the lobby door of my Hong Kong apartment building, ensuring a year of good luck and prosperity to all residents. 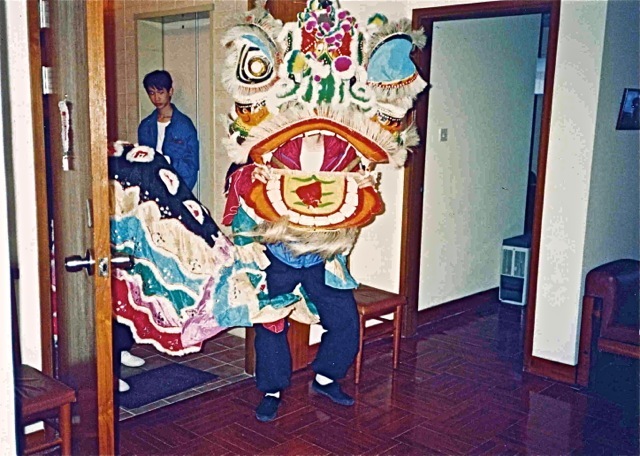 This lion danced into our flat in the Chinese University of Hong Kong. We were glad it was not accompanied by exploding fire crackers. To make up for the banning of firecrackers in the streets, Hong Kong had spectacular fireworks displays. 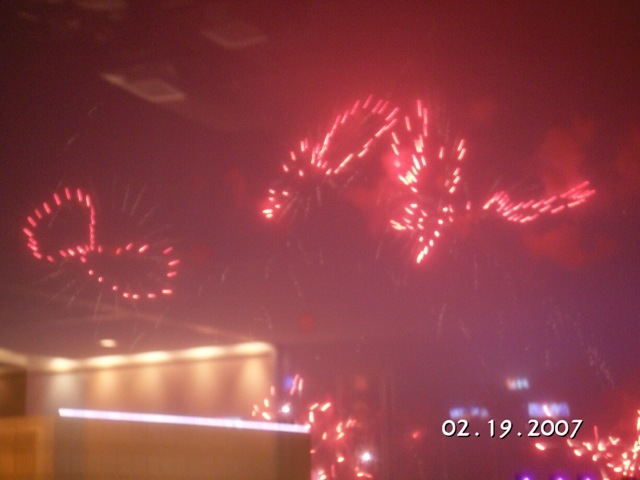 This scene of exploding 8s catered to Chinese preference for the number eight which sounds like “becoming prosperous”, 發.
Chinese consider the color red to be happy, being blessed, fulfillment and good fortunes. 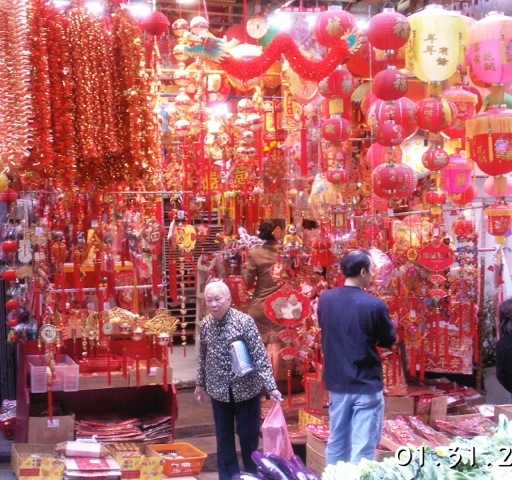 Homes and businesses would be decorated with red items to convey a feeling of cheer at new year holidays. This store apparently expected lots of business selling red decorative items. 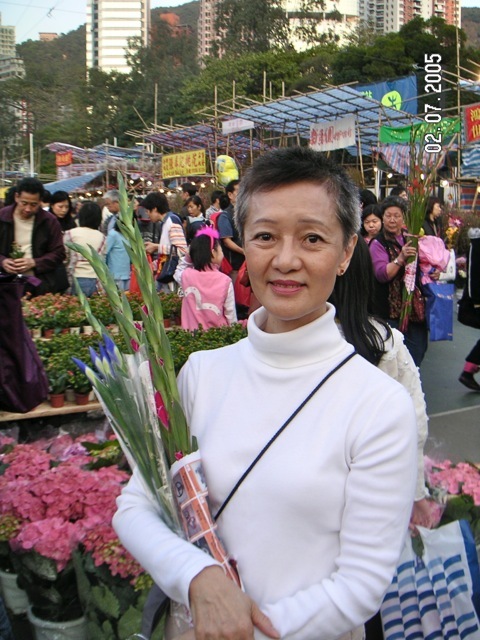 The Victoria Park in Hong Kong turned into a big week-long bazaar selling flowers, plum trees, foods and new year items. Sally bought flowers to decorate our home. 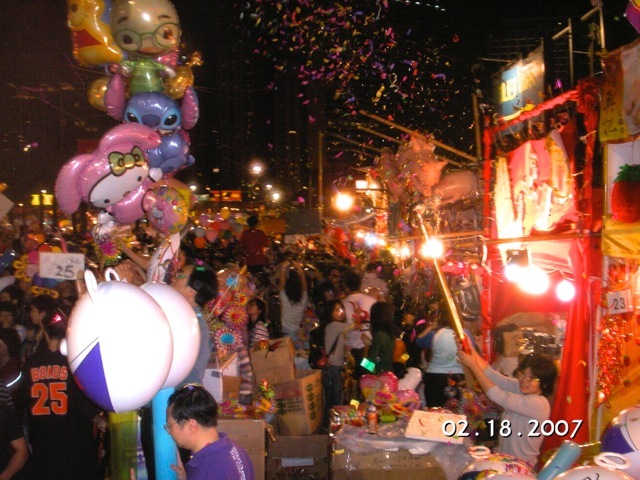 After dinner, thousands of merry makers crowded into the bazaar to see the displays and buy new year items. The tightly packed crowd kept its happy mood and everybody was tolerant of the extreme congestion. 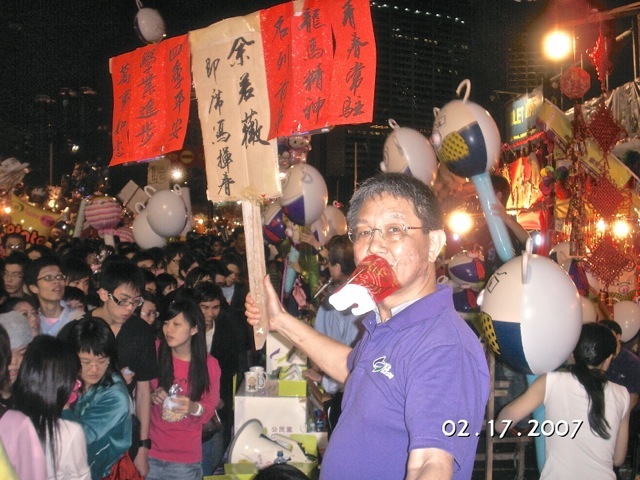 To help raise funds for the organization I belonged to, I competed with many other noisy hawkers for the crowd’s attention. I taped a rolled up cardboard to my face as an effective, if odd looking, bull horn. Posted by Robert Wu on Monday, January 27, 2014, at 11:01 pm. Filed under Uncategorized. Follow any responses to this post with its comments RSS feed. You can post a comment or trackback from your blog.